The History and Environmental of the Atlantic Region (HEAR) regional network (a sub-network of NiCHE) held its inaugural W.F. Ganong Colloquium on Febrauary 22nd and 23rd, 2008 at Dalhousie University in Halifax. The workshop was a tremendous success, with over twenty-five faculty members and graduate students from across the regions attending. On the Friday afternoon, there were presentations from Bill Parenteau, Department of History, University of New Brunswick, and Colin Laroque, Department of Geography, Mount Allison University. Both of these talks were recorded as part of the NiCHE Audio Archive and can be heard via the links below. Close to twenty people also attended our visioning session, Where to from ‘HEAR?’ on the Saturday morning. Throughout the workshop, there were lots of opportunities for informal networking and discussion over drinks, meals and coffee. Please do not hesitate to contact the HEAR organizers, John Sandlos (jsandlos@mun.ca), or Arn Keeling (akeeling@mun.ca) if you have idea for further events and projects. Thanks to Claire Campbell for hosting this event and providing such a wonderful environment for the first HEAR workshop!! Citation: Parenteau, Bill. 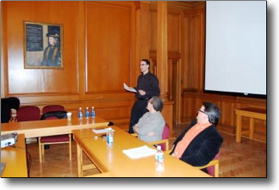 “Environmental History in the Atlantic Region.” Inaugural W.F. Ganong Colloquium. Halifax, NS. 23 February 2008. Citation: Laroque, Colin. “The Many Tales Tree Rings Tell” Inaugural W.F. Ganong Colloquium. Halifax, NS. 23 February 2008. Bio: Colin Laroque is a professor of Geography at Mount Allison University. Abstract: A physical geographer, Laroque introduces dendrochronology, the study of tree rings, and discusses how they can be a measure of past environments that textual records cannot indicate.